Laser hair removal is something I have been intrigued by for a long time. Mainly because I was fed up having to shave my legs every day. It is easy to get bamboozled by all the quick-fix offers on our TV’s and in our emails. I personally don’t think we should be looking to the cheapest bargain when it comes to cosmetic procedures, but the best therapists. Why oh WHY would you want someone who is out to make a quick buck by offering you the cheapest prices to be in control of something as personal as your looks? A) It’s not likely they are using the best machinery/products. B) It is likely they will rush through your appointment to fit the next appointment in. C) Would you trust someone who prides themselves on being the cheapest rather than the best? 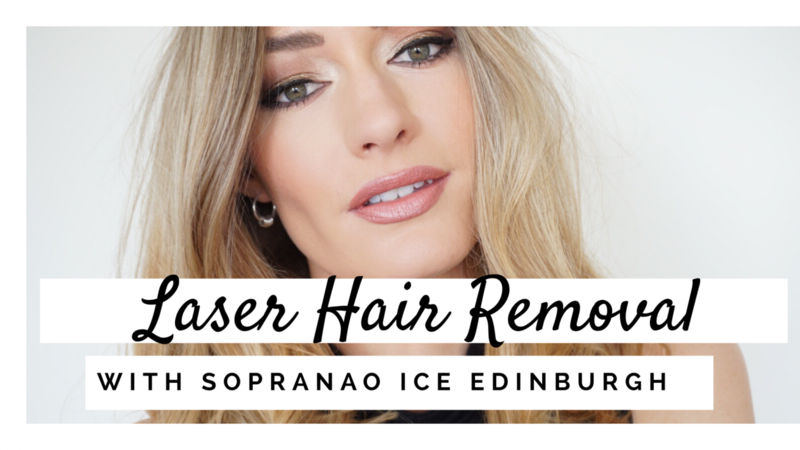 So when I heard that my favourite beauty clinic Soprano Ice Edinburgh had a laser hair removal system that is reputably pain free, I wanted to know more. What is Laser vs IPL (Intense Pulse Light) Hair Removal? Both treatments produce energy in order to disrupt the growth element of each hair follicle to reduce growth. However, this is where the similarity ends. The beam produced by IPL is wide-spectrum light (not lasers) which diffuses in the skin easily, not targeting a specific area. The narrow light beam used in laser hair removal produces a single, concentrated wavelength of light that penetrates deeper into the skin to reach the base of the hair follicle (making this much more effective at targeting the root of the problem … no pun intended). From my experience with the Soprano Ice machine, laser hair removal was painless, IPL has been reported to be much more uncomfortable like the sensation of an elastic band pinging back and forth off your skin. The Soprano Ice sweeping technique of moving the applicator repeatedly over the treatment area ensures full coverage while ICE™ technology cools the skin’s surface, preventing superficial burns and allowing for extremely comfortable, yet effective hair removal. Whereas IPL is a broken movement of light application which can lead to inaccuracy and longer sessions required. Now we have established that Laser Hair Removal is less painful and more effective than IPL therapy, lets consider WHY choose Soprano Ice. The Soprano Ice laser system is an award-winning machine that combines cooling technology to ensure the laser can maintain contact with the hair follicles while the skin is cooled, making your treatment much faster. Other laser hair removal machines don’t have this cooling technology so the heating sensation may be uncomfortable to clients. The cutting edge technology of the Soprano Ice machines makes laser hair removal an enjoyable, quick and painless experience. Watch the video above for a behind the scenes look at my first laser hair removal treatment and my after thoughts. I loved having this treatment, I can’t wait for the rest! The Soprano Ice machine creates a lovely warm feeling (the level of warmth can be adapted to the comfort of each client) that reminded me of that feeling you get on holiday when the sun makes you feel warmth from within. There was no discomfort during or irritation after. I definitely noticed an impact in growth after my first session, my legs didn’t feel as ‘stubbly’ as they grew back in. The joy of laser hair removal is that because it works on the base of your hair follicle, you can shave your legs without affecting your treatment, so you don’t have to put up with re-growth in-between treatments. It is advised that you avoid sun exposure for one week prior and after your treatment to avoid any irritation of the skin. Laser Hair Removal is available on most areas of the body, not just legs as I am having treated. See HERE for a list of treatable areas with Soprano Ice Edinburgh. Treatment is available to both men and women, the number of treatments needed will depend on each individual. The minimum recommended sessions for best results is 6, it can take upto 10 depending on your growth. Have you tried laser hair removal? What did you think?